One a penny, two a penny! Hot Cross Buns! That’s right…it’s time for the Hot Cross Buns to make an appearance. I’m sure you’ve been seeing them everywhere, but I must say, look no further! 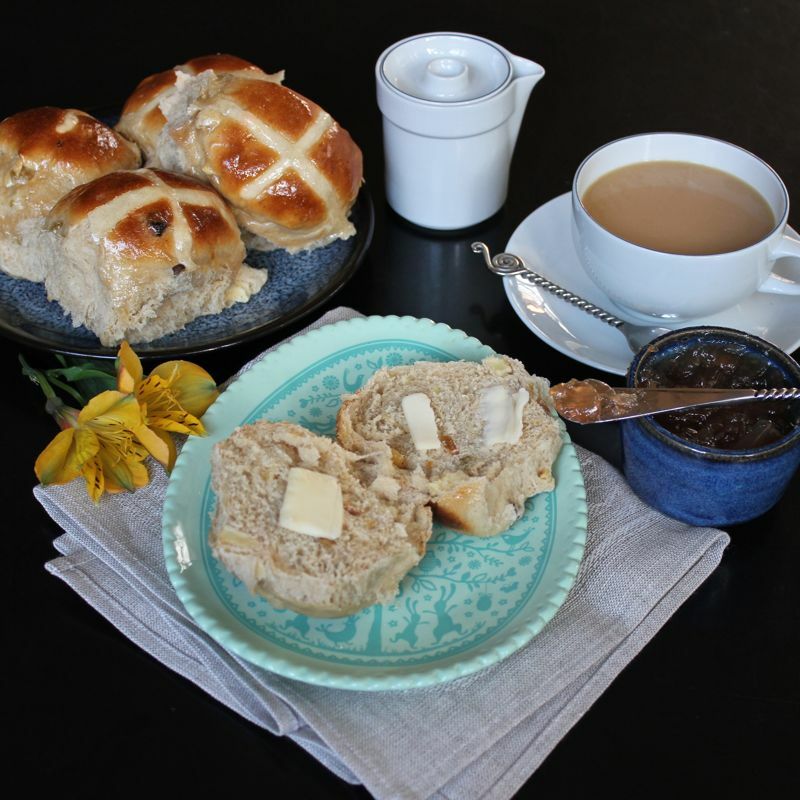 The best Hot Cross Bun recipe can be found right here. This year I made buns with a bit of a twist from the old traditional ones I usually do and baked Apple & Cinnamon Hot Cross Buns. Let me just say, they are dee-lish! They are incredibly moist and bursting with apple and cinnamon flavour, most likely due to a fresh homemade apple cinnamon compote which is added to the dough along with golden raisins, and bits of dried apple. And if that doesn’t tempt you, as soon as these little buns emerge from the oven, they are drenched in a syrupy apple cinnamon glaze. Do I have your attention now? Yum, yum, YUM! 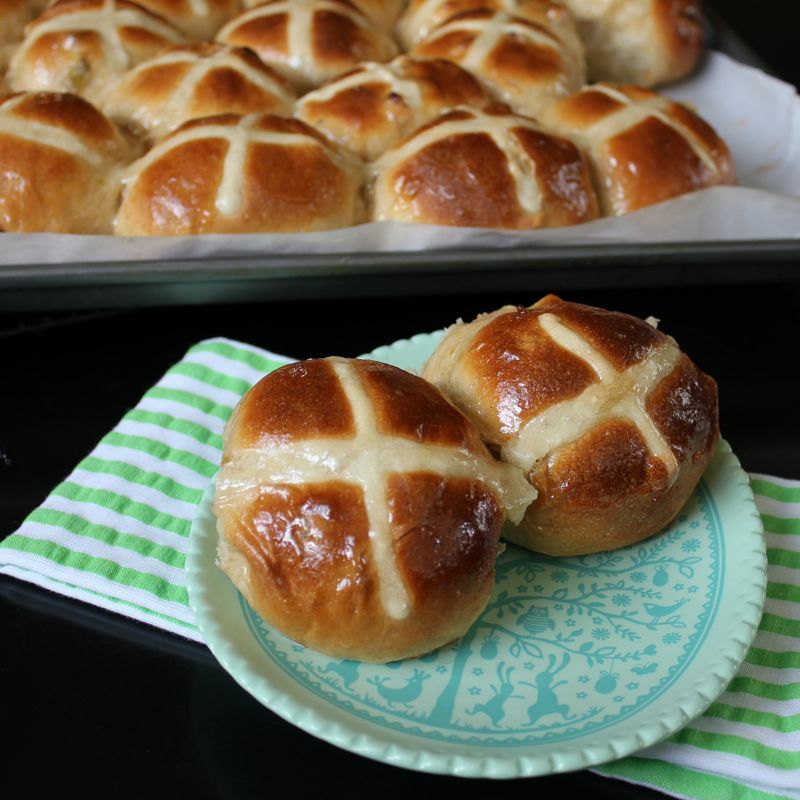 On Good Friday I always make Hot Cross Buns. I just have to do it. It’s like I have no choice. I find all of the lore surrounding them fascinating! Hot Cross Buns are traditionally eaten on Good Friday and the cross that adorns them is said to be a symbol of the Crucifixion. However, these little buns may even pre-date Christianity. The cross could possibly have been made in honour of the Saxon Goddess Eostre and in that case would have symbolized the four quarters of the moon. 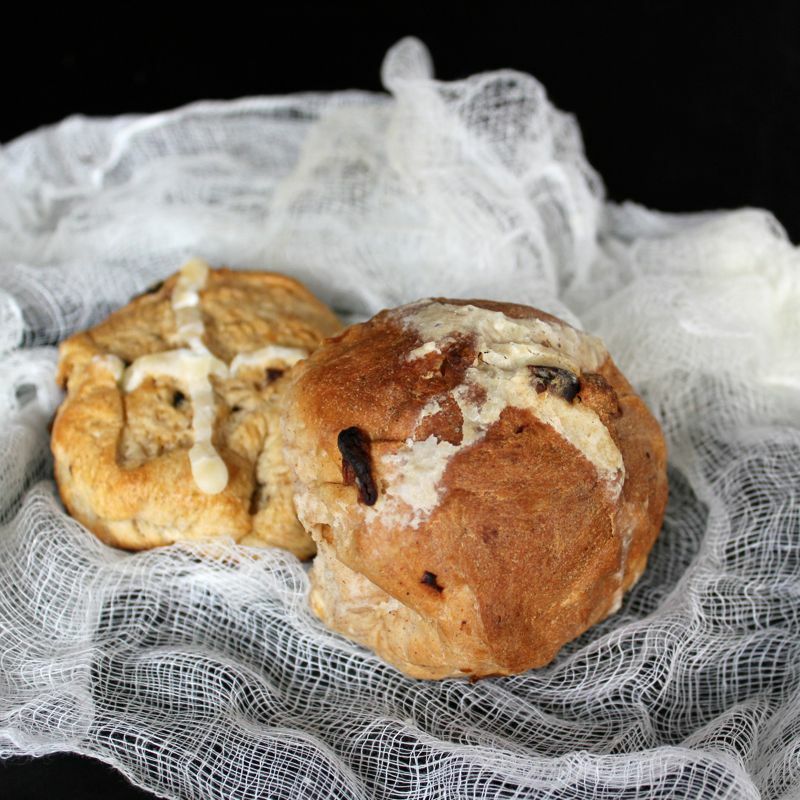 The Buns that are actually baked on Good Friday are said to have quite an array of powers besides their delicious taste. For one thing, these pastrys will never get moldy. I actually have been putting a Good Friday baked bun aside for several years now and I can attest, they do not mold! Preserved Buns from Easters past! Furthermore, if you hang one in your kitchen, it will not only protect your household from fires but will also work as a charm to ensure all of your bread baking endeavours will be successful. Indeed, a dried bun from the previous year, also has medicinal properties. You can grate a bit of it into the liquid of your choice to make a restorative elixir that will help sick folks regain their health. This powder can also be applied directly to wounds with the same curative results. Amazing! Now I must stress that only Hot Cross Buns baked on Good Friday itself have these powers. So most likely you’re going to have to bake them yourself on the actual day to ensure your buns are filled with these magical properties. 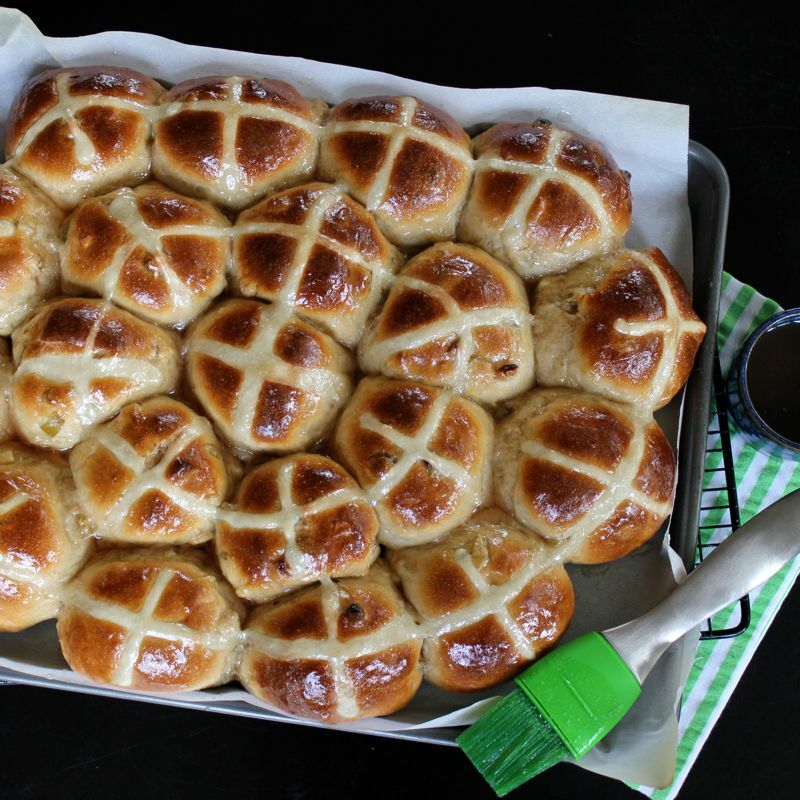 Hot Cross Buns are made with yeast, so just keep in mind, there are going to be a couple of rise times involved. You need to plan for it and unless you plan on getting up at o’dark thirty to start working on them, you probably won’t have them available for breakfast that morning. But you could have them ready by elevenses! They are a bit of work, but believe me, these buns are so worth it! And I had the most pleasant surprise. When I finished glazing the Hot Cross Buns I actually had some of the Apple Cinnamon Syrup left over. I set it aside and was quite happy to find that it had actually set up upon cooling, leaving me with a scrumptious jelly! 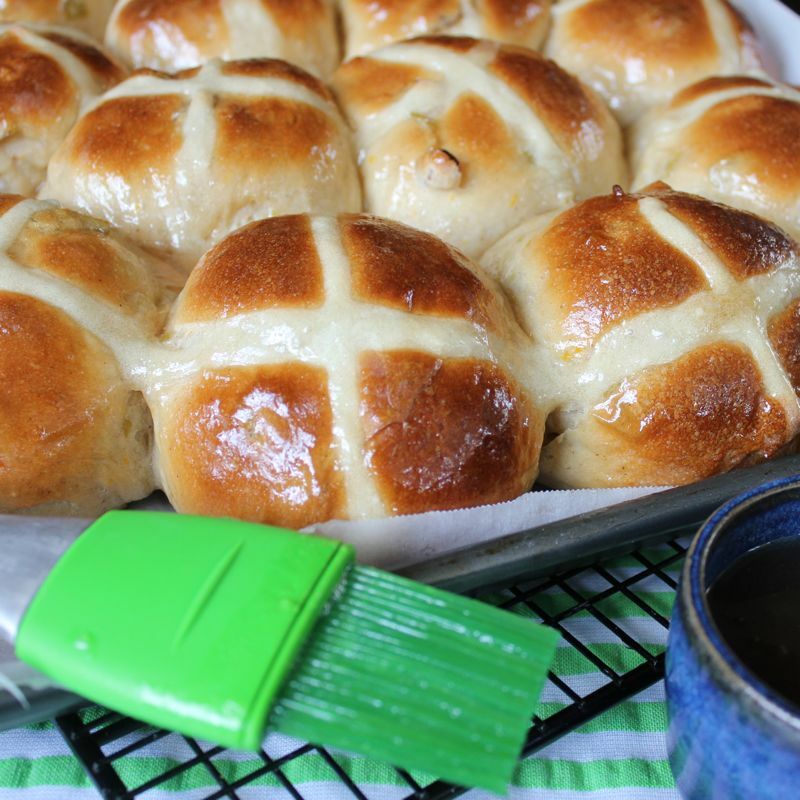 Yup….Apple & Cinnamon Hot Cross Buns with Apple Cinnamon Jelly. It just keeps getting better! You’ve gotta make these delicious buns today! Start with the compote: combine sugar and water in a medium saucepan, then squeeze in juice of half the lemon and stir over medium-high heat until sugar dissolves. Meanwhile, cut remaining lemon half into 3mm-thick slices, add to saucepan with Granny Smith apples and cinnamon quill. 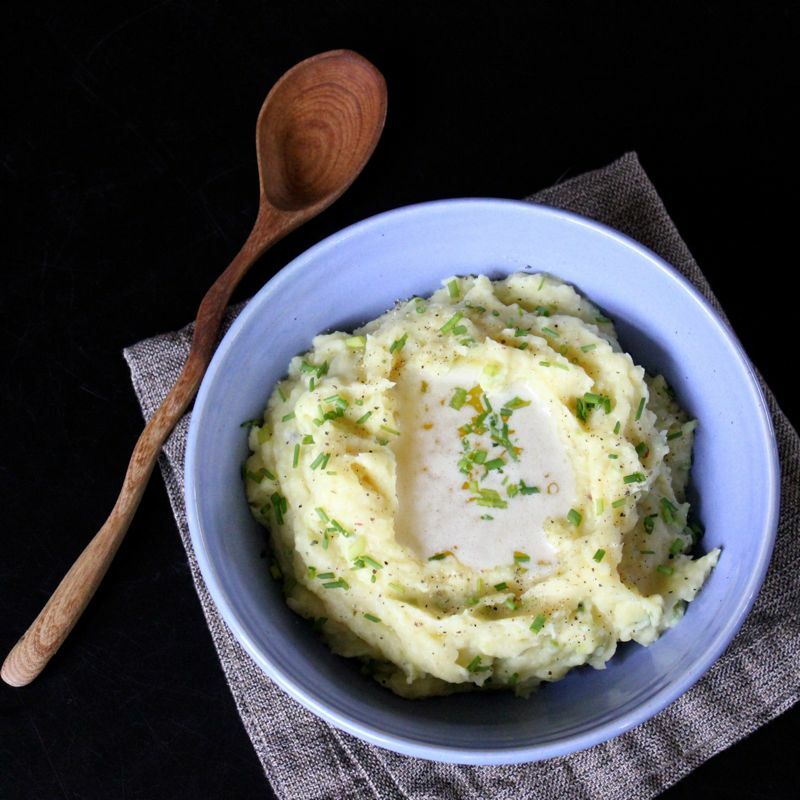 Bring to the simmer, reduce heat to medium and cook until lemon and apple are translucent (20-25 minutes). Strain, reserving fruit and syrup separately. When cool enough to handle, dice lemon, combine with apple. Remove the cinnamon quill, add it to the syrup and set aside. Combine flour, raisins, dried apple, yeast, ground cinnamon, allspice, zests, sugar, apple compote and salt in a large bowl and make a well in the centre. Combine milk and butter in a small saucepan, warm over low heat until butter melts and mixture is lukewarm. Whisk in egg, then add milk mixture to flour, stirring to form a soft dough. Turn onto a lightly floured surface and knead until smooth and elastic (8-10 minutes) – I used my Kitchen Aid with the dough hook to knead the dough; gradually added 1 cup flour because the mixture was too wet. You want the dough to pull away from the sides of the bowl, so just slowly add flour as you are kneading until you see this. 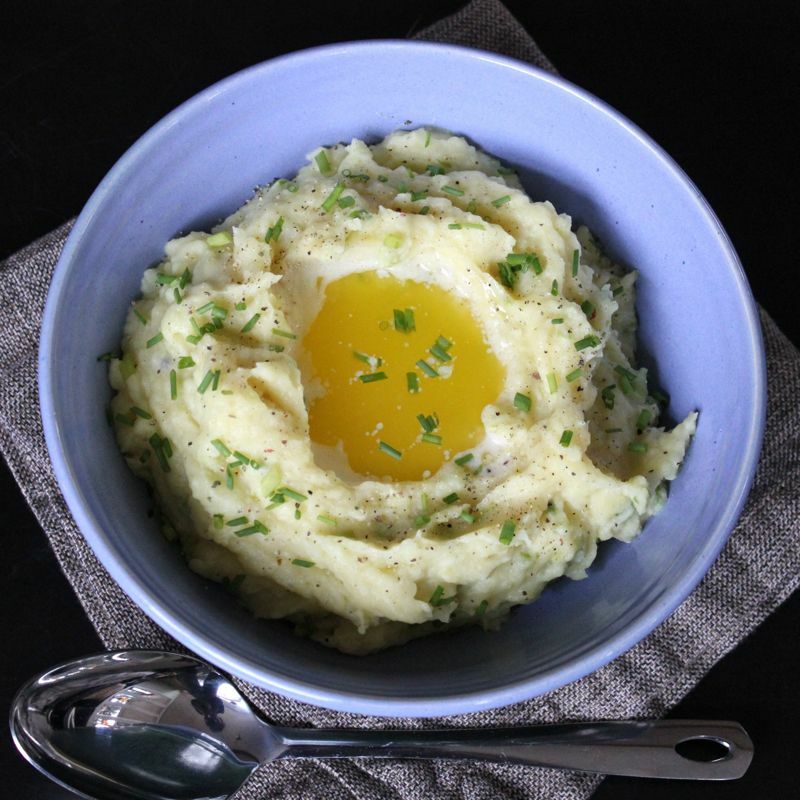 Place in a lightly buttered bowl, cover and stand in a warm place until doubled in size (30-40 minutes). Meanwhile, line a large baking sheet with parchment paper. Knock back dough, divide into 20 even pieces, then knead each piece into a smooth ball. Arrange dough in a large rectangle or concentric circles, placing balls side by side onto prepared sheet, leaving 1cm between each for dough to expand. Cover with a tea towel and stand in a warm place until doubled in size (30-40 minutes). Preheat oven to 220°C/428°F. Combine the 1/3 cup extra flour and ¼ cup (60 ml) cold water in a bowl and stir to a smooth paste. Spoon into a piping bag fitted with a small plain nozzle and pipe a cross shape onto each bun. Bake for 10 minutes, reduce oven to 200°C/400°F and bake until golden and buns sound hollow when tapped (10-12 minutes). Meanwhile, combine reserved syrup and cinnamon quill in a small saucepan and stir over medium heat until syrupy. Brush thickly over hot buns, then transfer buns to a wire rack to cool. Wow! Time flies! Seems like I just finished my St. Patrick’s Day blogging extravaganza and here it is nearly Easter! Again, my hat is off to all of you daily bloggers out there. I just took a week off to recover from my 17 day stint at it and I still feel a bit wobbly about the whole thing. I thought I’d ease back into the saddle today with a great Easter recipe that is also really easy to make. 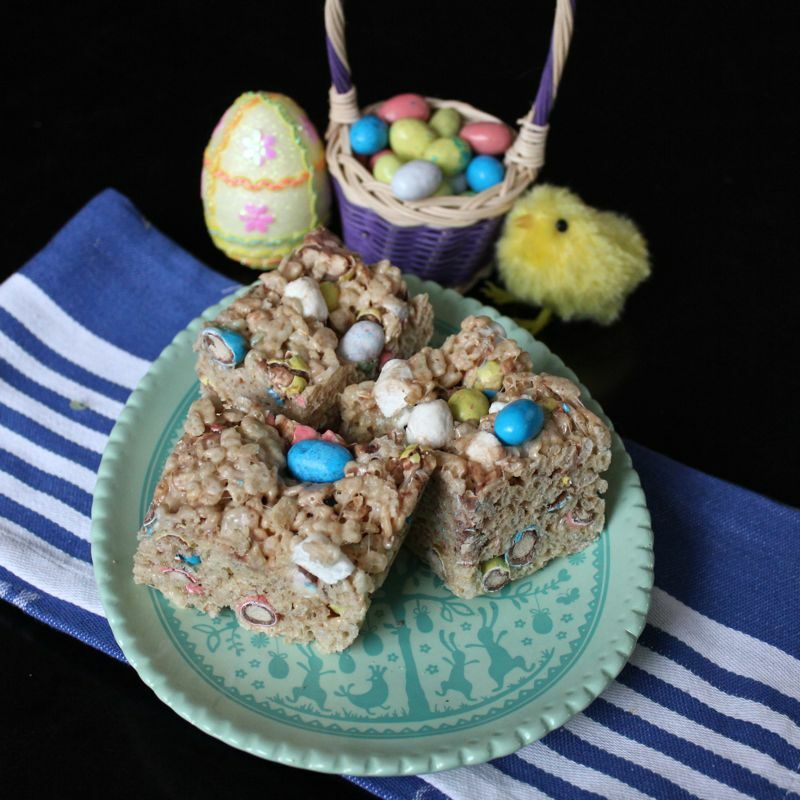 Robin Egg Rice Krispie Treats are just what they sound like, yummy Rice Krispie Treats with extra malt flavouring and one of my favourite Easter candies, Robin Eggs! For those of you who may be unfamiliar with Robin Eggs, they are made by Whoppers and are egg-shaped malted milk balls covered in pastel speckled candy shells. I love Robin Eggs and am so thrilled when they finally show up in the stores. The only Easter candy that lands above Robin Eggs as far as I’m concerned are Cadbury Mini Eggs. Oh my God! Don’t get me going about those little devils. Addictive, like crack. I literally can’t stop once a bag is opened. I haven’t reached that level with the Robin Eggs, though it may not be far off. I did polish off a bag of them the other day while working on taxes (better a bag of candy than a bottle of wine when tax preparation is concerned). I had one more bag left, so I figured I better do something with them pronto. That’s when I remembered seeing Sweet Southern Blue’s post about these Robin Egg Rice Krispie Treats, so I got right to work. Not that it’s a lot of work, I must admit. I can get a pan of Krispie Treats done and dishes washed in about 15 minutes flat. And I’ve gotta say, it is pretty awesome that you can make such a classic, delicious, crowd pleasing snack at the drop of a hat! Sweet Southern Blue makes use of her microwave to melt the marshmallows. I’m still an old-fashioned top of the stove gal and prefer to use the mini marshmallows over the big fellas. My husband and I both like to find the occasional whole unmelted mini marshmallow scattered throughout our treats, so I always hold back a handful or two of them to throw into the melted marshmallow butter mix along with the cereal. And I decided to use the mini version of Robin Eggs, also reserving a few whole eggs from being chopped to decorate the top of the treats. Of course the big version of Robin Eggs would work perfectly well, you just might need to do a bit more crushing prior to adding them into the mix. 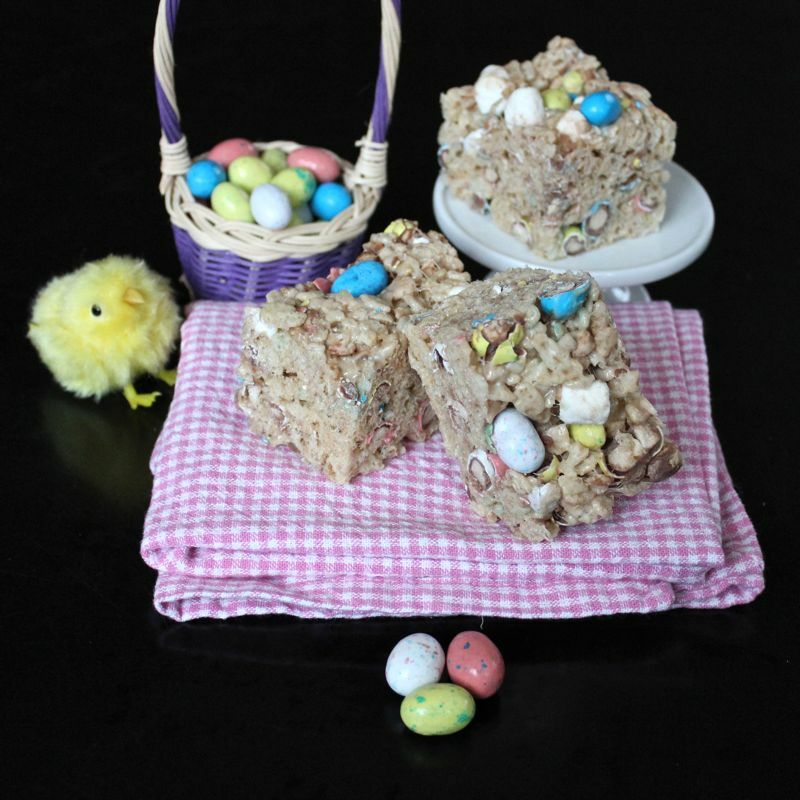 These treats would be great to make with the kids before Easter or a good way to use up Easter candy afterwards. Indeed, this recipe is certainly adaptable to whatever left over candy is on hand (sorry…what exactly is left over candy?!). Not matter what ingredients you choose, before you know it, these adorable treats will be made and your family singing your praises. 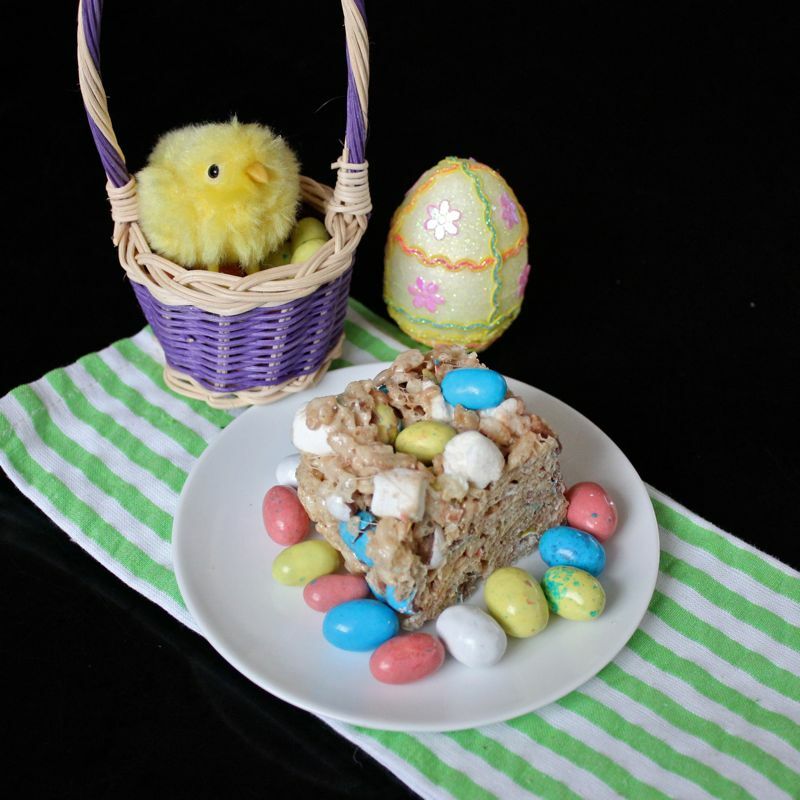 I mean who doesn’t like a Rice Krispie treat, and with Robin Eggs to boot…what a winner! Butter a 8×8″ pan. Set aside. 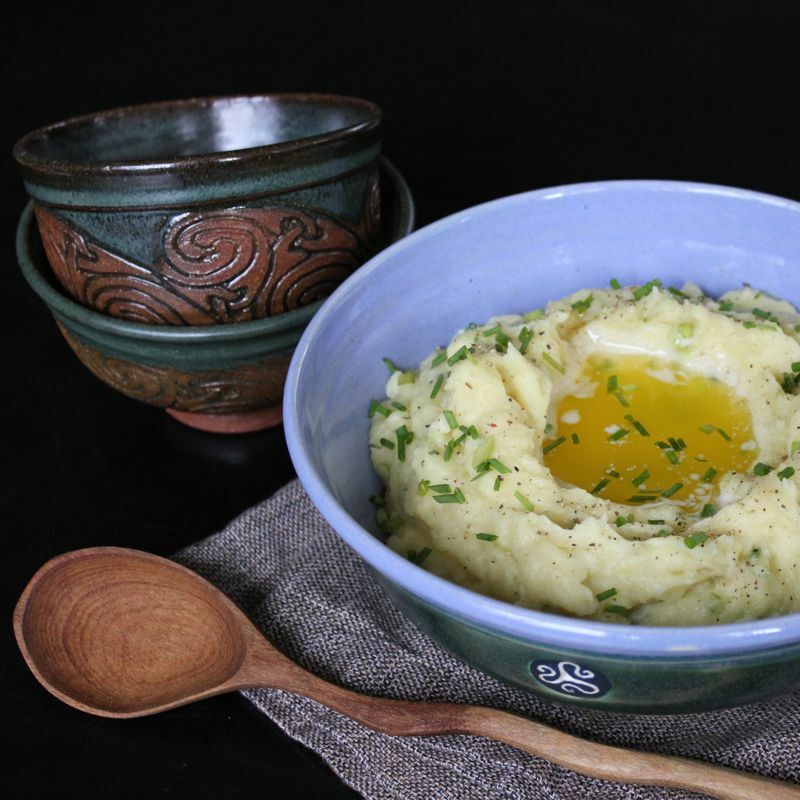 In a saucepan melt butter over low heat. Add marshmallows (remember to hold back a few if you like seeing the occasional whole unmelted marshmallow) and stir until completely melted and smooth. Remove from heat and add the malted milk powder stirring until combined. Add the Rice Krispie cereal and chopped Robin Eggs (as well as any reserved marshmallows). Mix until well coated. Using a buttered spatula, press mixture into prepared pan. Lá Fhéile Pádraig Sona Daiobh! (Happy St. Patrick’s Day!) Woohoo! It’s finally here! Everyone is Irish today! 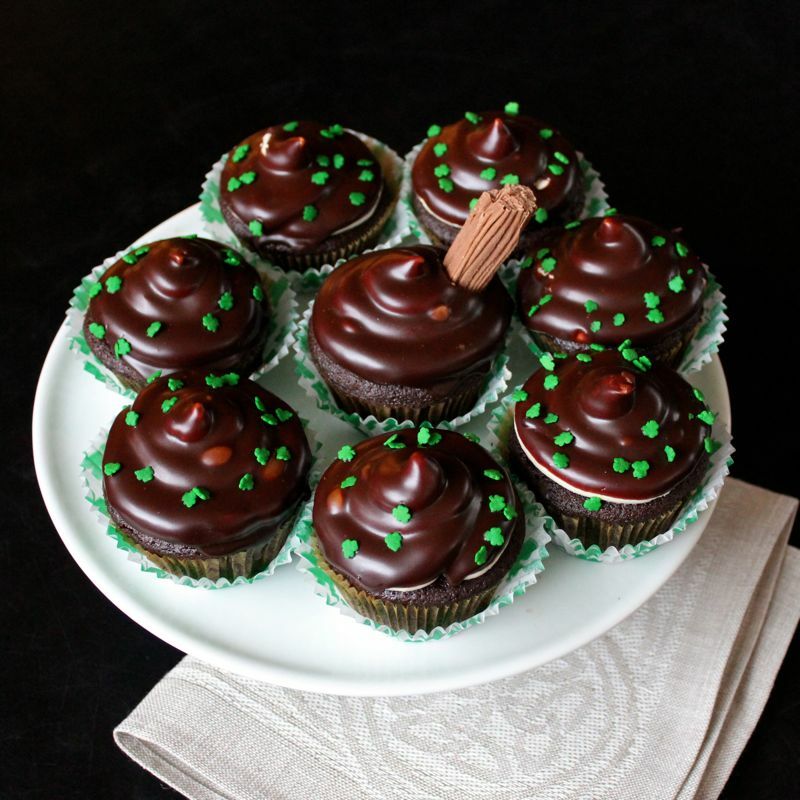 I’m sticking with my blogging tradition and featuring a tasty Irish-y cupcake on St. Patrick’s Day. 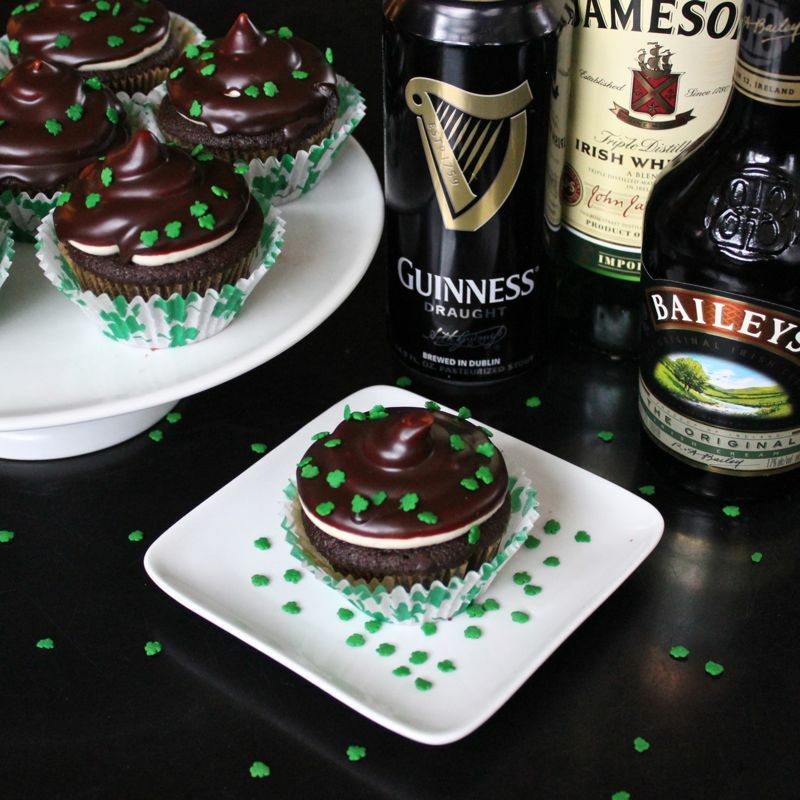 Two years ago it was Irish Car Bomb Cupcakes, last year brought you Guinness Chocolate Cupcakes with a Swiss Vanilla Baileys Buttercream Frosting and today…(drumroll please….) 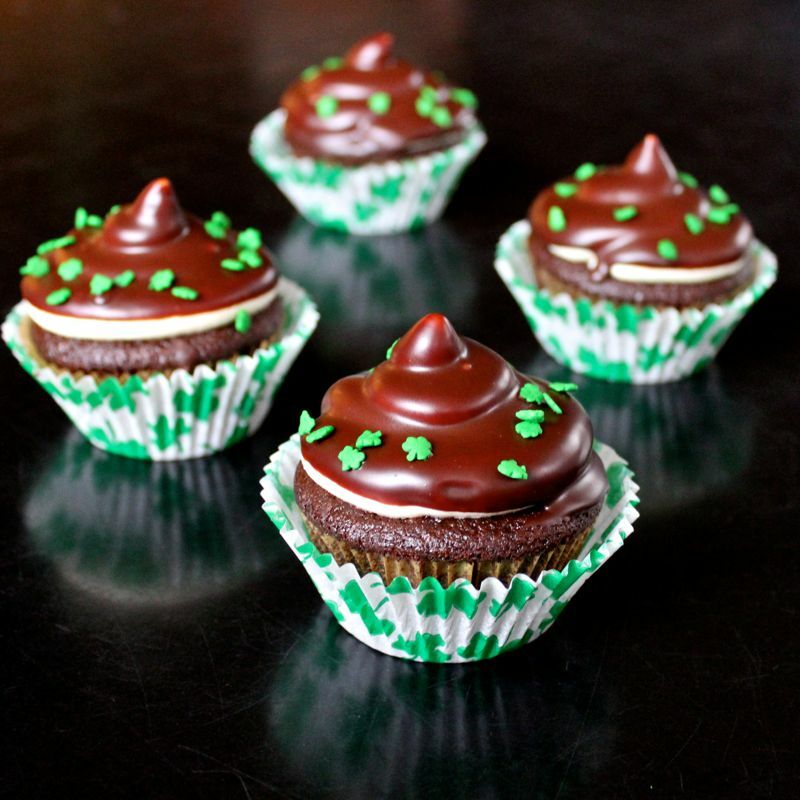 we have these deliciously decadent Chocolate Whiskey Dipped Irish Cupcakes. 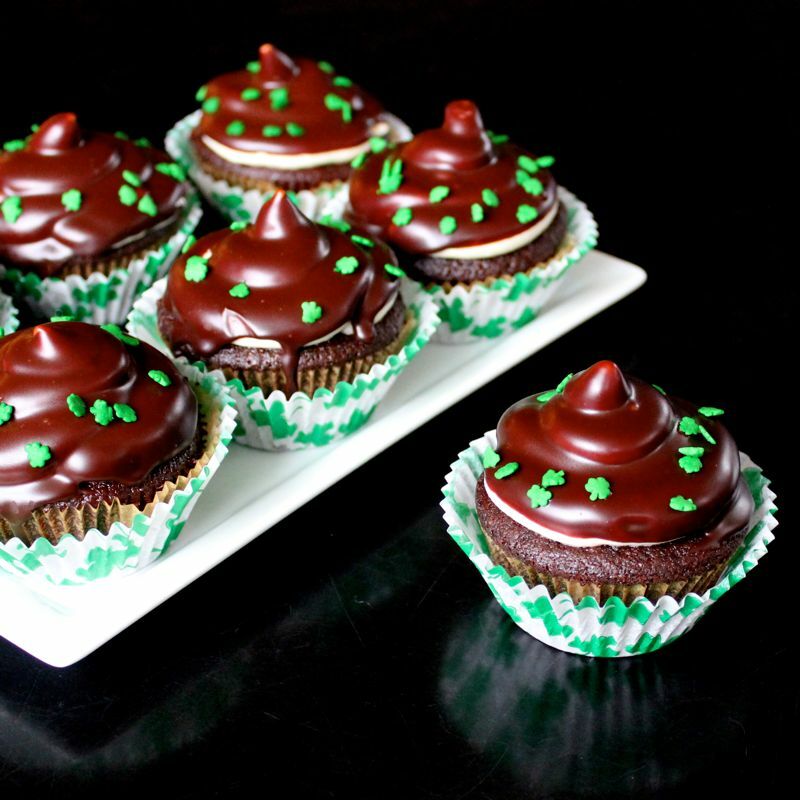 And just like all of my previous St. Patrick’s Day cupcakes, these little devils are a bit boozy. In fact, they have a perfect trifecta of Irish Booze. 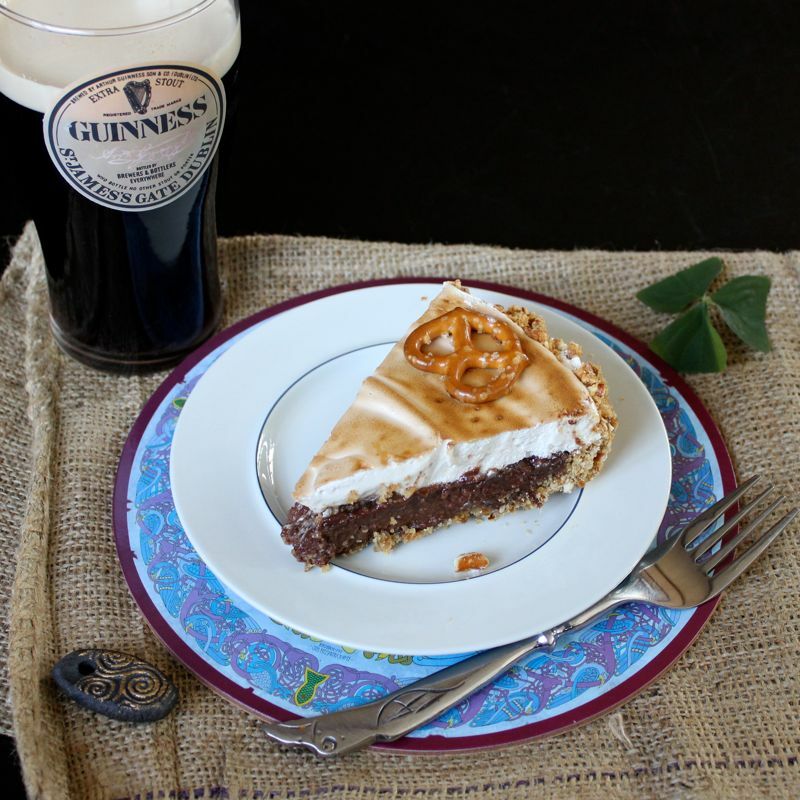 The cake portion of this treat is a rich chocolate Guinness creation, which is then topped with a velvety Baileys Cream Cheese Frosting. That sounds great all on its own right? 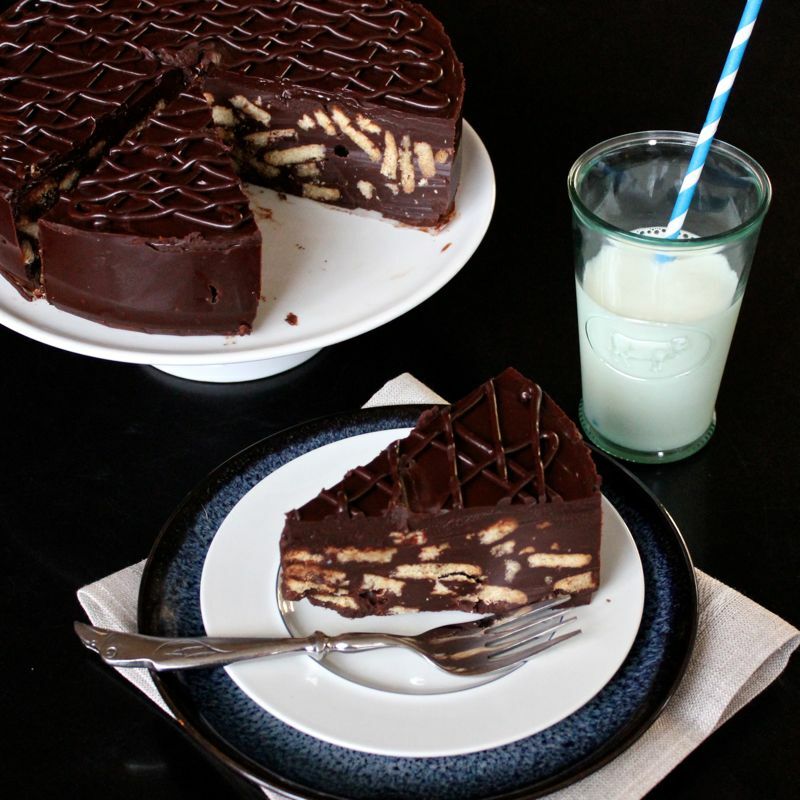 I could’ve stopped there, but oh no….I then dipped the whole thing into a Irish Whiskey spiked Chocolate Ganache! Be still my heart! I was inspired to make these when I saw Arctic Garden Studio’s Irish Coffee Cupcakes. I loved the idea of piling on all of that creamy Baileys frosting and then dipping the cupcake into the whiskey chocolate. 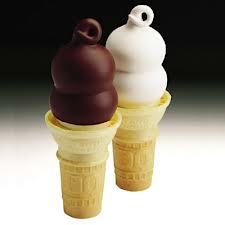 It reminded me of those dipped soft serve ice cream cones. You know like the ones at Dairy Queen, or from a Mr. Whippy truck or a 99 Flake ice cream for all of you in Britain and Ireland. 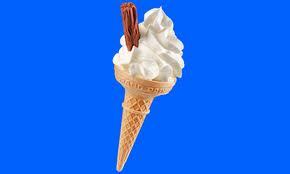 For those of you unfamiliar with a “99” it is a soft serve vanilla ice cream cone which has a piece of a Cadbury chocolate bar which is called a “Flake” stuck into it. You can find them at all the shops etc. in Ireland. I even managed to find a Flake candy bar in good old Virginia, no small feat, and stuck it in one of my lovely cupcakes as a bit of an homage to the “99”. Even without the added Flake, these cupcakes are so reminiscent of dipped soft serve ice cream, albeit rather boozy – perhaps there is an adult ice cream truck – that my husband has christened them “Whiskey Whippy Cakes” which I like, but thought it might leave a lot of folks confused, so I went with Chocolate Whiskey Dipped Irish Cupcakes officially, but around here it’s another story! I don’t know what it is about us and ice cream cones recently. Perhaps we’re just ready for Spring, but since we don’t have those Spring temperatures yet, I guess we will just have to make do with these little boozy cupcake imposters. Ha! Everyone who knows me, knows I LOVE cupcakes so I’m not making much of a sacrifice here! These Whiskey Whippy Cakes will definitely make our St. Patrick’s Day all the more festive. Which reminds me, I think it’s time for a little celebratory drinky. 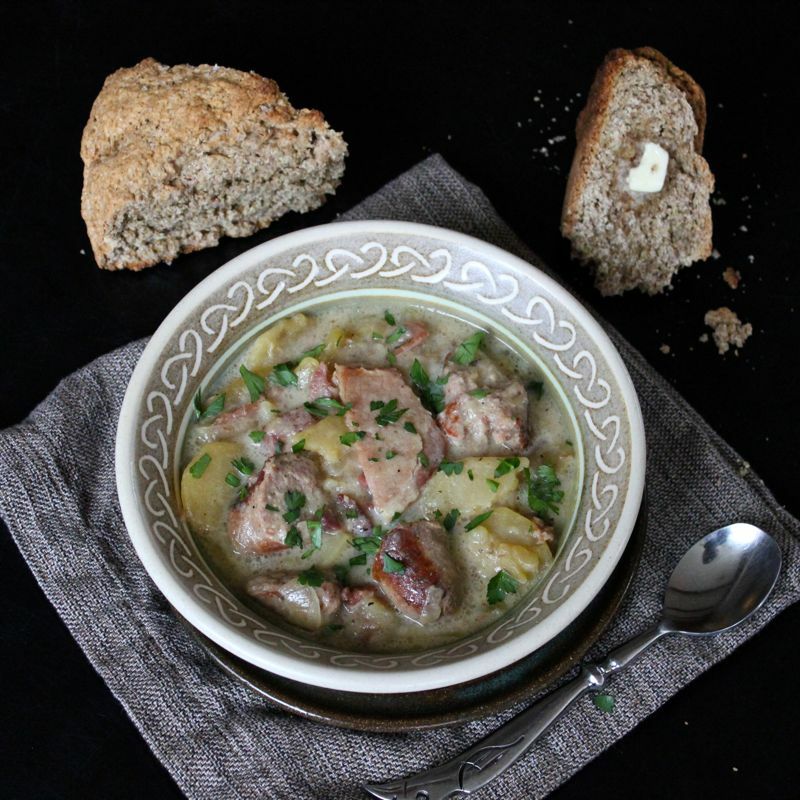 I have managed to blog about an Irish-y dish everyday from March 1st up through today. Phew! I’m probably going to have to take a few days off after today’s publication, but don’t worry, I’m already planning out some great tempting future treats. 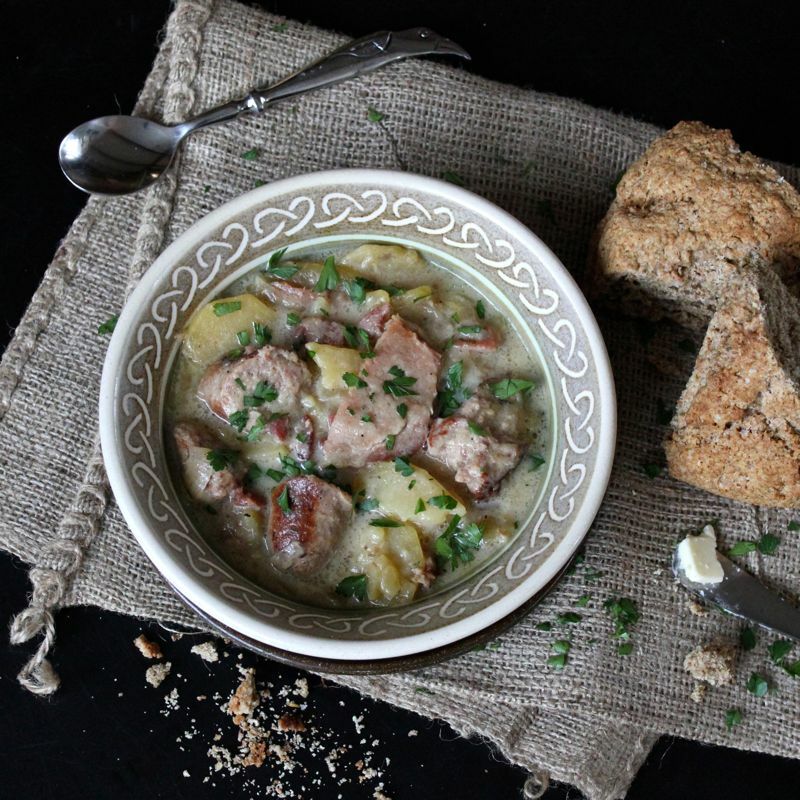 In the meantime, check out some of my favourite blogs which come to you from Ireland to see what they’re cooking up, like: The Green Apron, I married an Irish farmer, Edible Ireland, Warm&Snug&Fat and The Daily Spud. 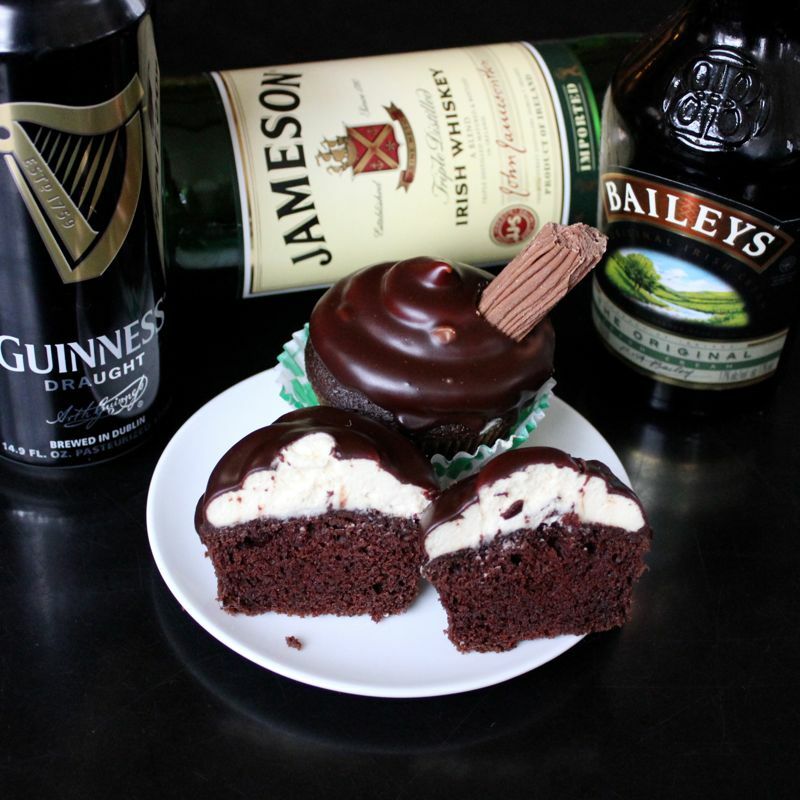 And when you’ve finished browsing, get busy baking some of these mouth-watering Chocolate Whiskey Dipped Irish Cupcakes with their Guinness and Baileys and Whiskey (Oh My!) Just the ticket for a Happy St. Patrick’s Day! I hope everyone has a great time! In a large mixing bowl, whisk together the eggs and sour cream, then whisk in the cooled chocolate and butter mixture. Whisk in the flour, sugar, baking soda, and salt, combining until just moistened. Fill each muffin cup with 1/4 cup of batter, so that the cups are 2/3 full. Bake for 20-25 minutes, until the cupcakes are set and a toothpick comes out clean (mine took about 24 minutes). Allow to cool completely before frosting. We only have one day to go and it will be here! You know what I’m talking about…St. Patrick’s Day! It’s happening tomorrow ya’ll! Woohoo! I am so ready. I have all of my green clothing laid out and ready to go. Yup. I am going to do the green clothing thing. Now before all ya’ll Irish folks judge me, let me just say, if you don’t wear green over here on the day, people will pinch you! I do NOT want to be pinched and I actually like wearing green. I think it suits me, soooo….there you have it! But we’re here to talk about food right? Not rude, pinchy people, so onto the fabulous recipe. 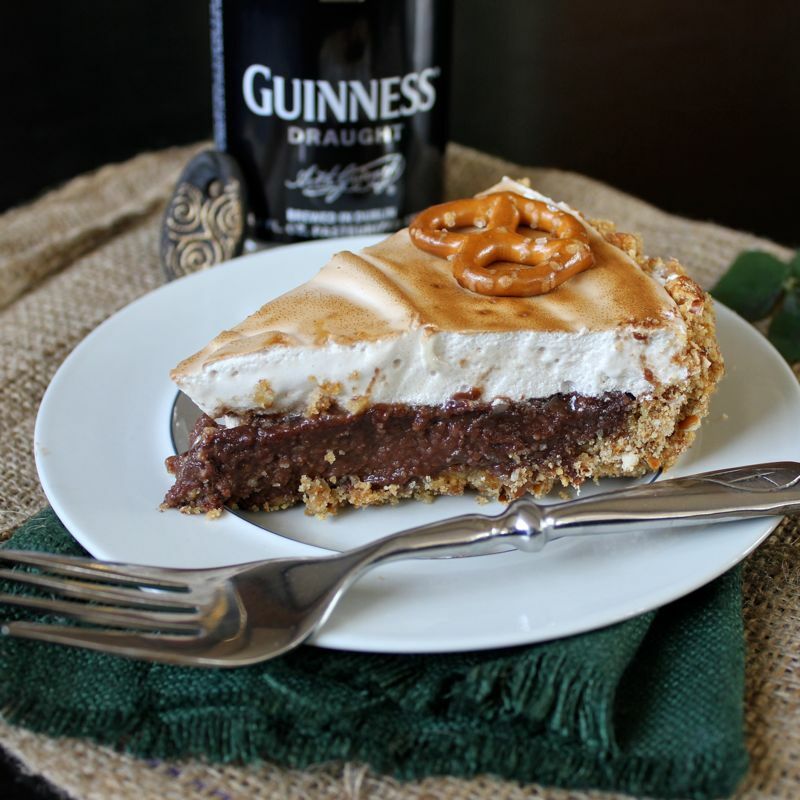 Today it is Sweet & Salty Guinness Chocolate Pie with Beer Marshmallow Meringue. 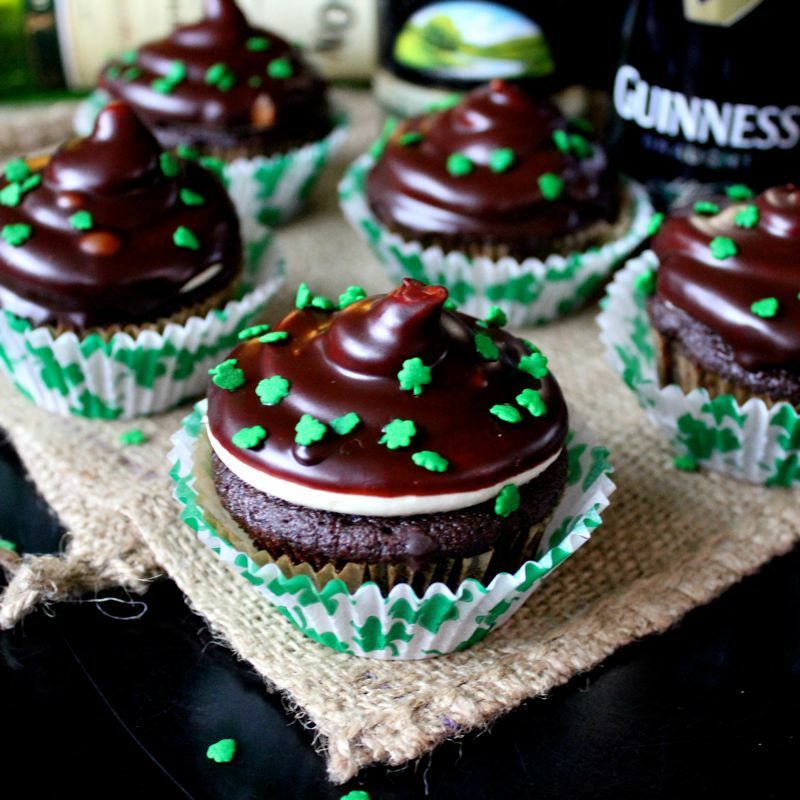 How completely outstanding does that sound….sweet, salty, Guinness, Chocolate, Marshmallow. Good Lord! Bring it on! 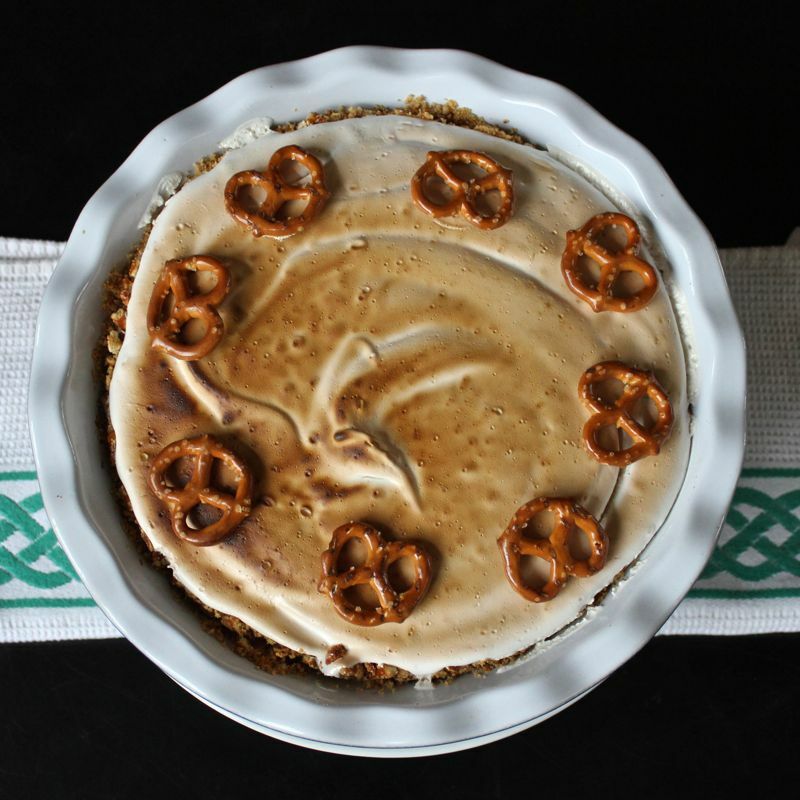 Now this pie has a sweet and salty pretzel graham cracker crust, which is filled with a Guinness infused Chocolate pudding and topped with a toasted Guinness Marshmallow Meringue! What an embarrassment of riches!!! Believe it or not, when I first started talking this pie up to my friends, I did have one who said “Oh, I don’t really like meringue pies very much”. I totally get that. I’m sure it has something to do with dry meringue pies made by totally well-meaning Grandmas. However, this Beer Marshmallow Meringue is like no meringue you’ve experienced. It is more like a melted marshmallow fluff. Totally gooey and delicious! I don’t even know if I can legally call it meringue (I can only hope the “meringue police” are not monitoring me at this moment.) And we’ve only talked about that topping at this point. 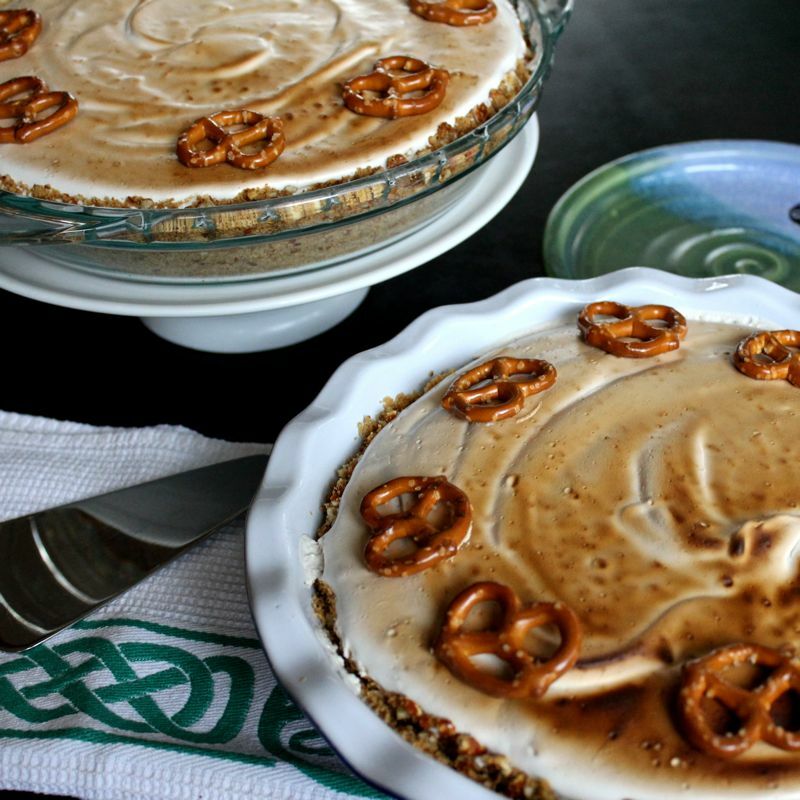 Let’s not forget the rich, chocolatey Guinness pudding filling or the lovely sweet yet salty pretzel crust. 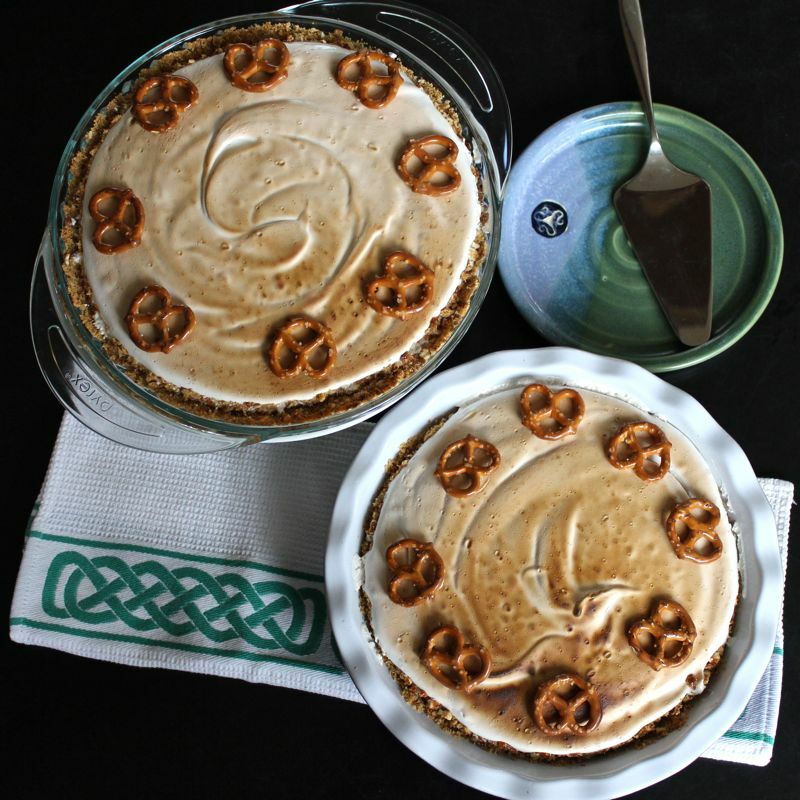 What an absolutely perfect St. Patrick’s Day dessert. And what are you waiting for? It is happening tomorrow! Get busy! Reheat oven to 350° F.
In a medium bowl, mix together pretzels, graham cracker crumbs, butter and brown sugar. Stir together with a rubber spatula until well incorporated. 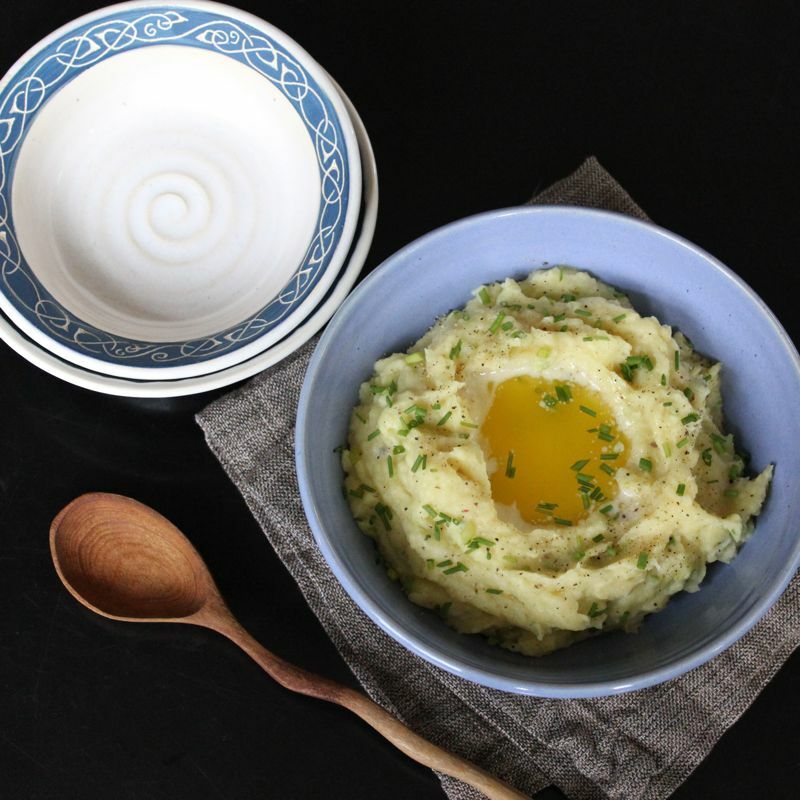 Whisk together egg yolks and sugar in a non-reactive bowl. 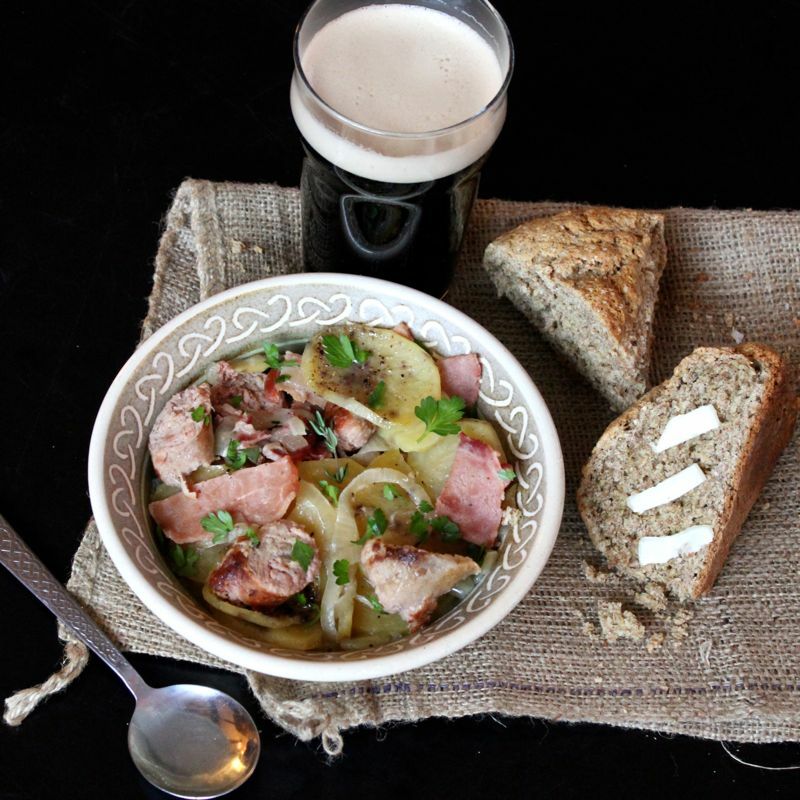 Pour 1 cup of Guinness in a heavy-bottomed 3-quart saucepan (reserve the rest for later use – no drinky! Not yet anyway, but remember …St. Patrick’s Day is nigh. Your time will come!). Add heavy cream and whisk to combine. Set over medium-high heat and cook until very hot but not boiling. Remove from heat and whisk in chocolate. When chocolate has melted, whisk in the egg mixture in a very thin stream as to not scramble the egg. Whisk in cornstarch and return to heat source. Whisk over medium heat until thickened. Divide mixture between pie pans. Use a rubber spatula to effectively remove all the pudding from the saucepan; quickly smooth the chocolate into the crust. Refrigerate while making the marshmallow topping. Whisk sugar, egg whites, water and salt together in a large metal bowl. Set bowl over a simmering pan of water; whisk constantly until sugar dissolves and mixture is hot to the touch. Remove bowl from simmering saucepan and stir in marshmallows pieces. Let stand for 3-5 minutes until marshmallow pieces have softened. Return bowl to simmering water and beat together using a hand-held mixer. Beat for several minutes until mixture thickens. Remove bowl from simmering water and add beer reduction. Continue to beat mixture until it has cooled slightly. Divide mixture between two pie pans and place under broiler in oven. Watch constantly – it’s easy for the marshmallow to burn! Remove from oven when nice and toasty. Refrigerate pies until well set – about 3-4 hours. Do not skip this step. The meringue needs the refrigerator time to set properly. Note: Use a warm knife (dipped in hot water then wiped dry) to achieve cleanly cut slices of pie. That marshmallow topping is sticky! 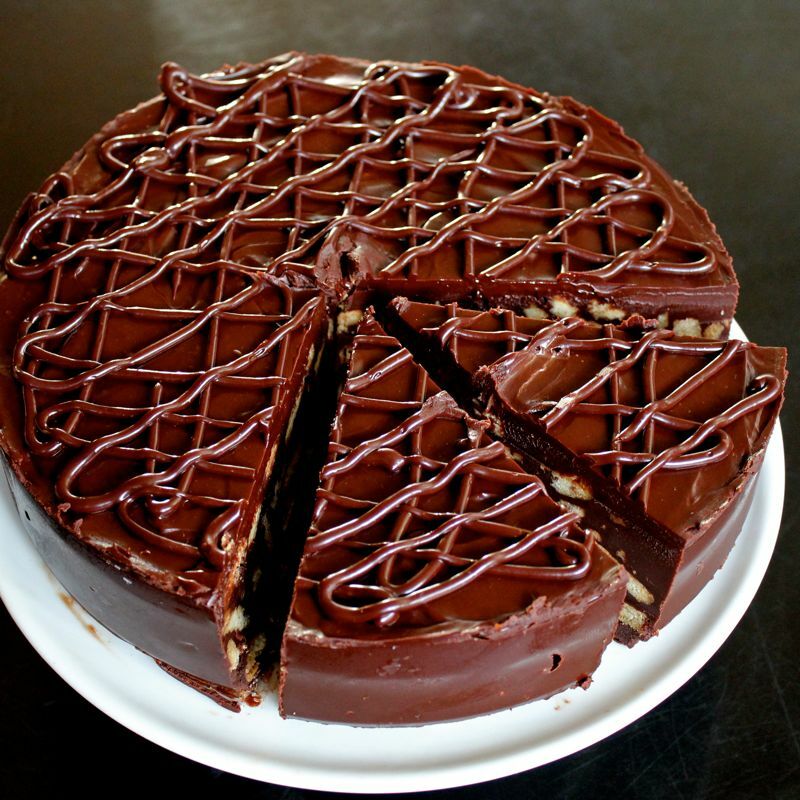 Chocolate Biscuit Cake is one of my favourite cakes. I had never heard of it before heading off to Ireland for college where I ran across it in a little bakery in Cork. The gal behind the counter called it “Tiffin” and after experiencing just one bite of its rich, chocolatey decadence, I was hooked. I’m sure many folks in the States had never heard of it either until it got so much press a couple of years ago when Prince William chose it for his groom’s cake, I guess thereby proving it is a confection “fit for a king”. But for those of you who somehow missed out on all of the hoopla surrounding the royal wedding (where exactly were you? ), a Chocolate Biscuit Cake is just what it sounds like, a dense chocolate cake with pieces of crumbled biscuits (cookies) running throughout. There are so many things that are fabulous about this cake. First of course is how utterly scrumptious it is. I mean complete chocolate bliss. And the cookies stay wonderfully crunchy, even after a day or two. (Ha! As if this cake would still be around a day or two after it is made!) The second glorious thing about this cake is that it is ridiculously easy to make. I’m not exaggerating. There is no baking involved. You basically melt some chocolate with butter, cream, and golden syrup, add some crumbled biscuits and pour it into a prepared pan and stick it in the refrigerator. Ta Da! 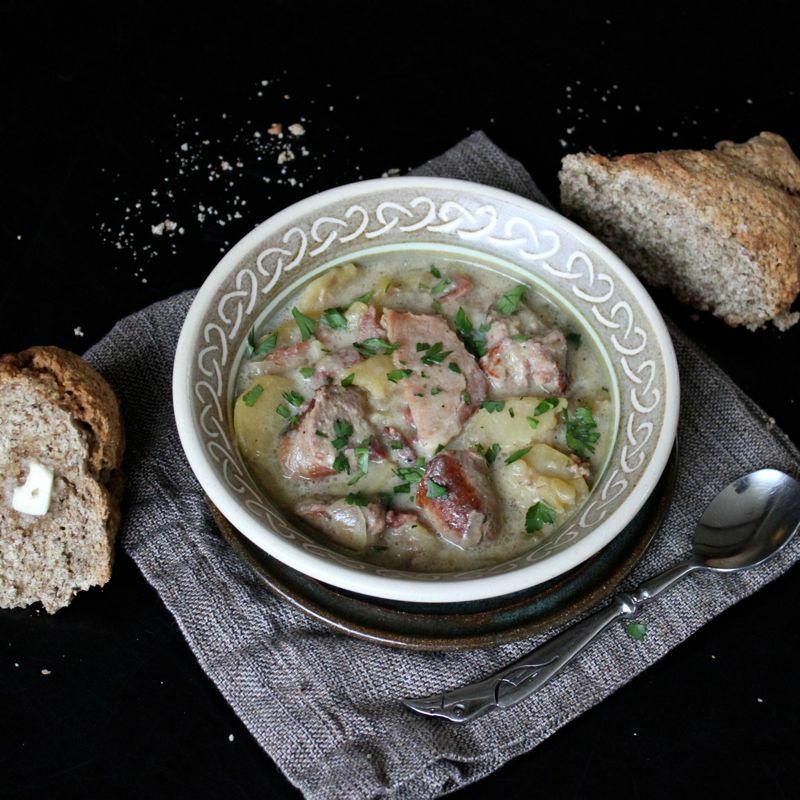 There are a couple “foreign” ingredients you will need to try to track down. The biscuits traditionally used are digestive biscuits and the brand I prefer is McVities. If you are in the States, many larger grocery stores will carry some brand of Digestive Biscuit in their “International Food” section. If you can’t find them you could substitute in a butter cookie like Le Petit Beurre, Rich Tea Biscuits or simply Graham Crackers. Lyle’s Golden Syrup is a treacle, like molasses, but with a lighter color and less bitter taste. Again the best place to look for it is in the International Food section or possibly Baking section of a large grocery store. The King Arthur Flour store also sells it. A good substitution if you absolutely can’t get your hands on it is Dark Corn Syrup. 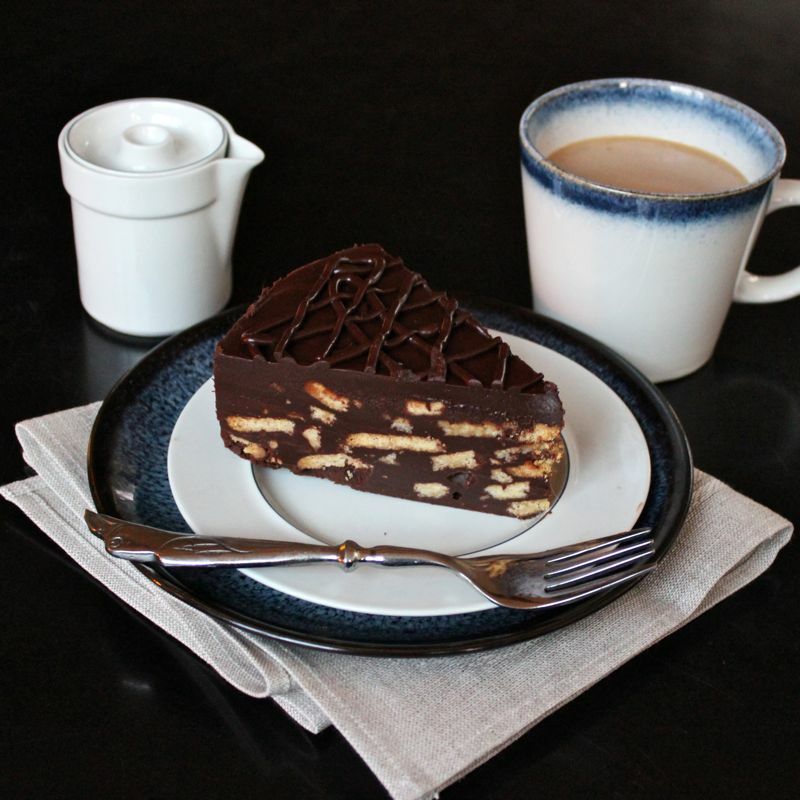 I will also mention that Edible Ireland has posted a great recipe for Chocolate Biscuit Cake that does not require Golden Syrup, so take a look there as well. 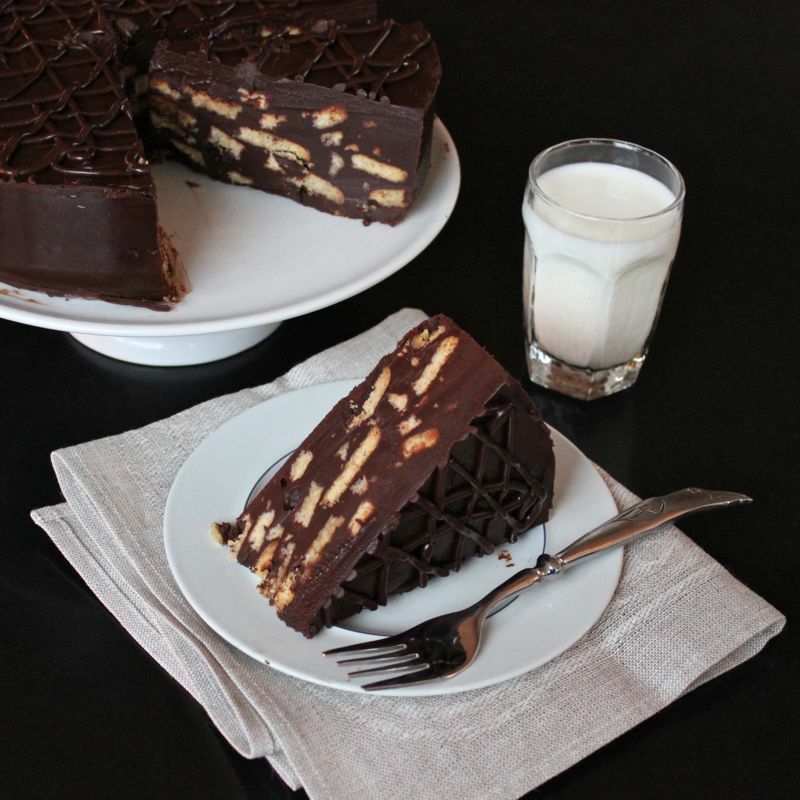 Chocolate Biscuit Cake is quite versatile. You can make it in any shape pan you prefer, round, square or loaf tins are fine. And you can easily customize this recipe by adding your favourite treats into the mix. I’ve seen recipes that call for rum soaked raisins, various nuts, or chopped up candy bars. Edible Ireland puts espresso powder in their biscuit cake, which I think sounds divine. This luscious cake is verrrrrry rich. Think of a cake made of fudge. A tiny sliver of a slice will go a long way. I’m not sure what sort of “chocolate coma” I would be in if I ate a slice the likes of which I have pictured here. Now I’m not saying I haven’t eaten that much biscuit cake in a day. I’m sure I’ve managed even more. But my modus operandi is to methodically slice off “small, little tastes” every time I walk by the cake and then to wonder at the end of the day what it is about being in the refrigerator that causes so much shrinkage in cakes! 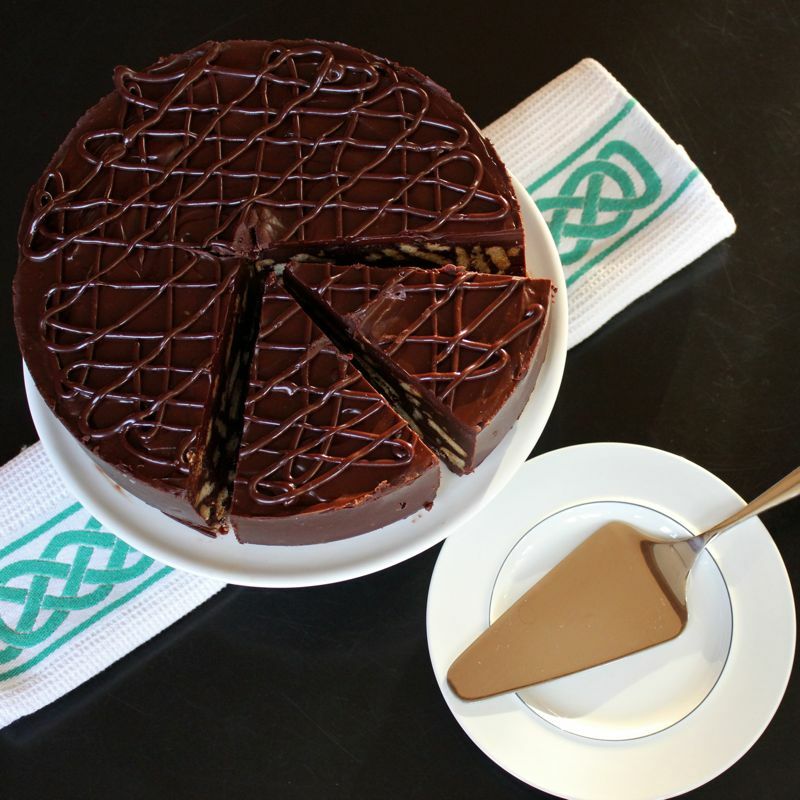 Treat yourself to a Chocolate Biscuit Cake on this St. Patrick’s Day. Melt the butter over medium low heat. Add the chocolate and salt and continue over medium low heat until the chocolate is fully melted. Remove from heat and stir in the whipping cream and golden syrup until smooth. Fold in the broken biscuits and pour into a 9 inch springform pan that has been lined with plastic wrap or parchment paper. Chill in the fridge for at least 3 hours or overnight. Remove from pan and glaze with chocolate ganache. Scald the cream in the microwave until almost boiling. Pour over chocolate in a small bowl and let stand for five minutes. Stir until smooth then stir in the corn syrup. Pour over the cooled biscuit cake using a spatula to help cover it evenly. 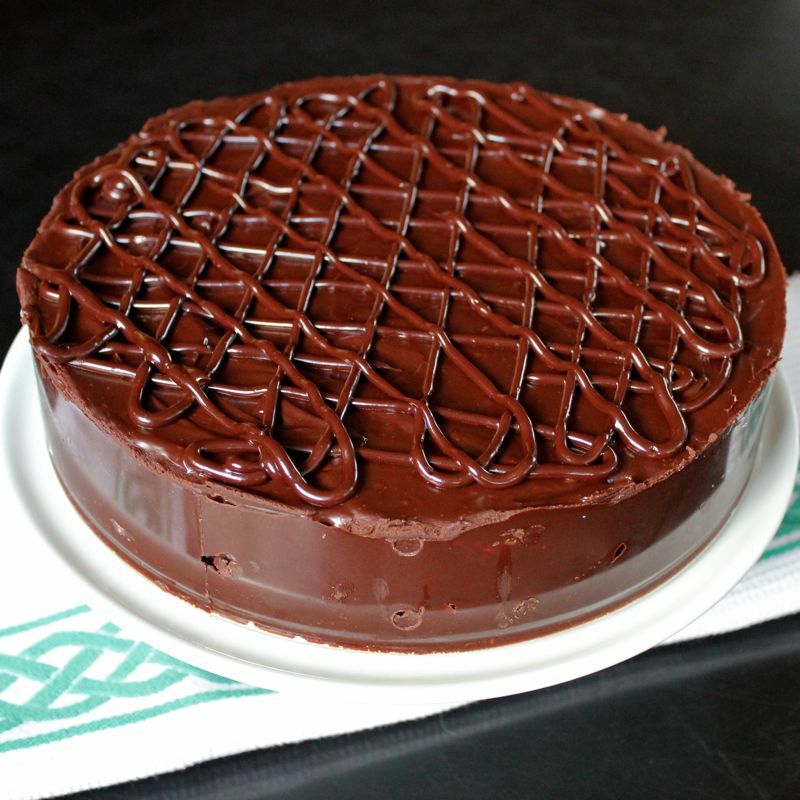 Reserve a bit of ganache to decoratively pipe or drizzle onto the top of the cake if so desired. You are currently browsing the Lea & Jay blog archives for March, 2013.